I know I’ve said this before, but I am still of the opinion that gluten free flours have a tendency to be either nutritionally poor and mildly flavored, or nutritionally good and strongly flavored, and unfortunately, many of the strong flavors are too intrusive and so we have to mix our flours to moderate them, or settle for the less nutritious flours. Teff appears to be a moderate flour; on its own it approaches the nutritional value of whole wheat, and there are no harsh notes. Don’t expect it to taste like wheat bread, but do expect it to taste like a great specialty bread. This loaf was springy, flexible, and moist; easy to slice and slightly dense, and reminiscent of the malt loaf that I absolutely loved as a kid. It isn’t sweet, however, so it’s fine for savory sandwiches (although I am SO tempted to make a sweet one to toast). I cooked this at a low temperature in order to get a soft crust, which it obligingly gave me. 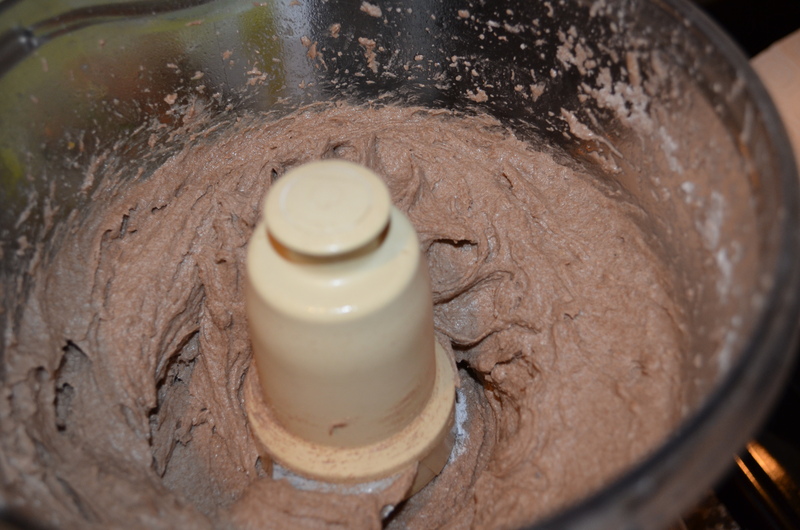 Put all the dry ingredients in a food processor. Put all the wet ingredients in a jug. Start the processor, and slowly (over a period of about 10 seconds) add the wet ingredients to the dry. Process for about 2 minutes to activate the xanthan gum. Risen dough ready to go in the oven. 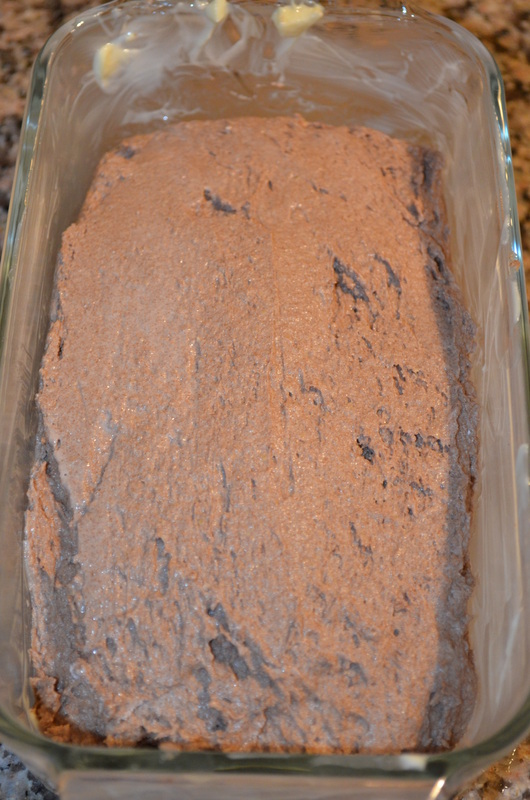 Scrape the batter out into a greased loaf pan; smooth the top, and allow to rest somewhere warm to rise by about 50% (~35 minutes depending on liveliness of your yeast and ambient temperature). Place the pan in the oven, cover with a sheet of parchment or foil, and set the temperature to 330F. Bake for 65 – 70 minutes (timed from turning on the oven, not from getting up to temperature). Remove from the pan, and allow to cool (ha ha!) before slicing. 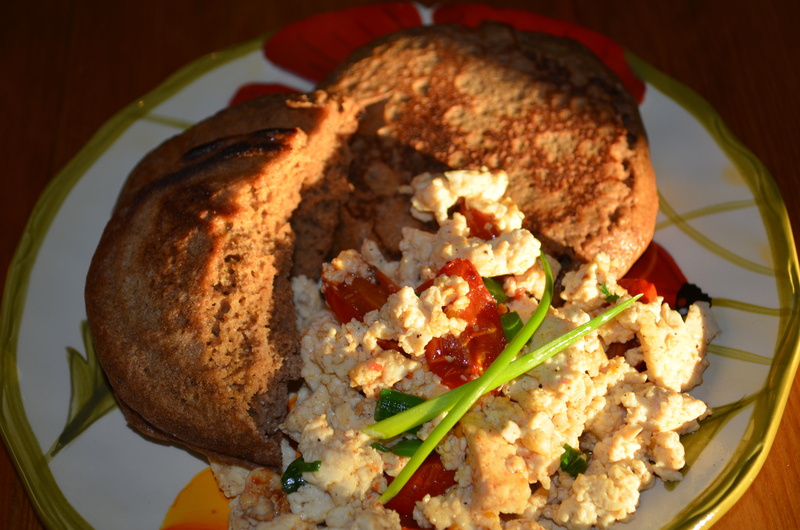 Teff American Pancakes served here with scrambled tofu. These pancakes are moist, light, and springy; a little more flavorful than wheat pancakes, with slight undertones of chocolate. 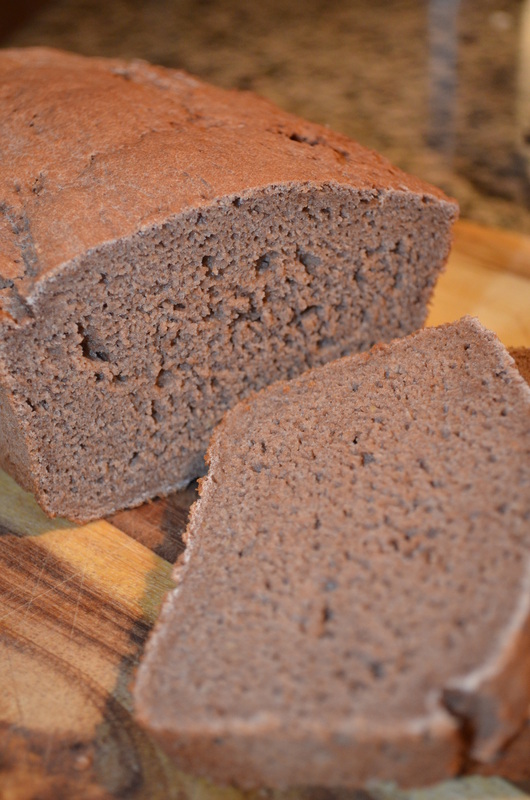 Teff seems to be a very well behaved gluten free flour. These American style pancakes are soft and springy, with the sweet version having a taste mildly reminiscent of an orange and milk chocolate cake, which is great for those of us who appear to be unable to tolerate chocolate! It’s also low-FODMAP, if that’s something that bothers you. This amount makes two 4″ pancakes. Put all the ingredients (except oil) into a cup or small mixing bowl, and beat together briefly with a fork to form a batter. Heat the oil in a frying pan until hot (and a splash of water instantly beads up and evaporates if splattered in the pan). Reduce the heat to medium low, and spread out the oil with a spatula or by tilting the pan. 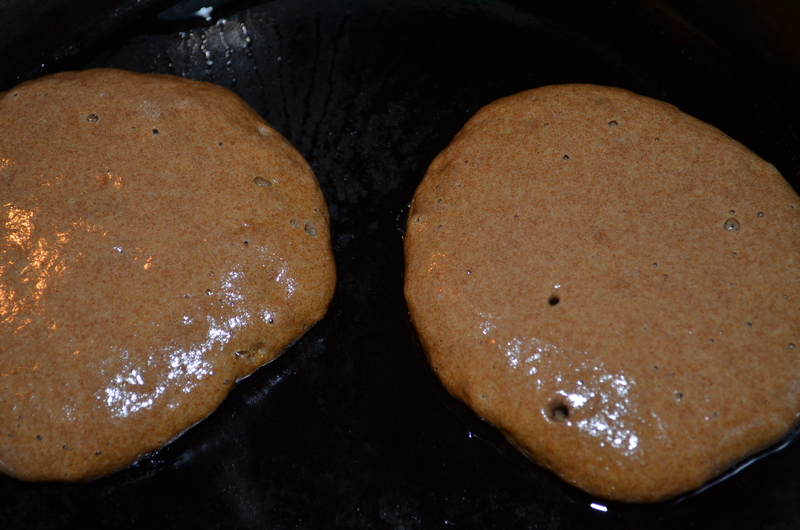 Pour out the batter into two rounds in the frying pan, and allow to set for about 2 minutes until small bubbles have appeared on the surface of the pancake, the edges have set (and look less shiny), and the bottom has browned slightly. Use a spatula or fish slice to flip each pancake over, and cook the other side for about a minute or until it too is lightly browned. Serve hot with the usual breakfast accompaniments. The texture of this bread is reminiscent of bagels, with a close-ish texture which tends to fight back slightly when you eat it. 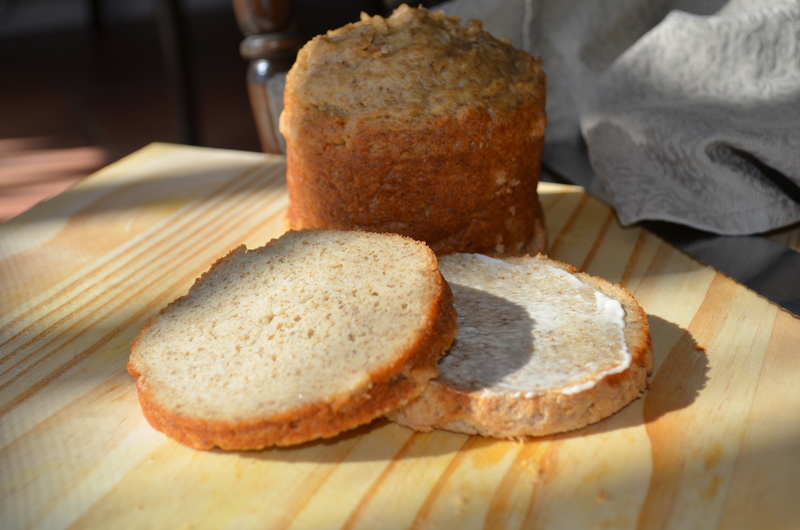 It makes a nice, flexible, sandwich bread with a soft crust, (best eaten on the day of cooking) and excellent toast (any time). Recipes for steamed bread frequently call for coffee tins for the cooking vessel, but since our coffee comes in cardboard containers, I figured that wouldn’t work for us. Instead, I used 2 large (28 oz) tomato tins, whose lids I had removed with one of those tin openers that don’t leave a sharp edge. I scrubbed them out, and scoured the cut edge with a dish scourer to make sure there were no bits of loose metal, and heavily greased the inside before dropping the bread dough into place. Note that the dough won’t rise further once you’ve put it on to steam, so make sure it’s as risen as you want it before getting to that stage. 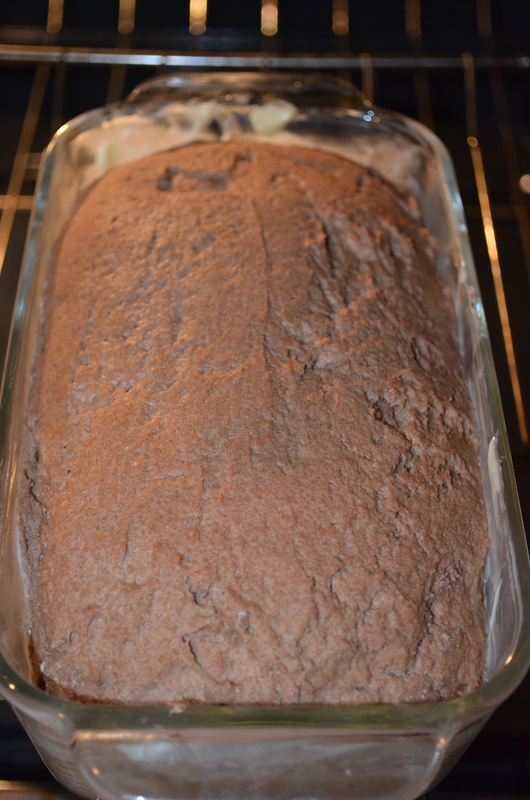 Update: Initially, I used 1 tbsp of sugar in this recipe, but when I increased the sugar to 3 tbsp, the bread rose significantly better, but didn’t end up tasting sweet, so I’ve adjusted the recipe to reflect that. Mix the yeast and sugar with 1/2 cup warm water, and leave for 5 – 10 minutes so the yeast can prove that it’s alive and turn frothy. 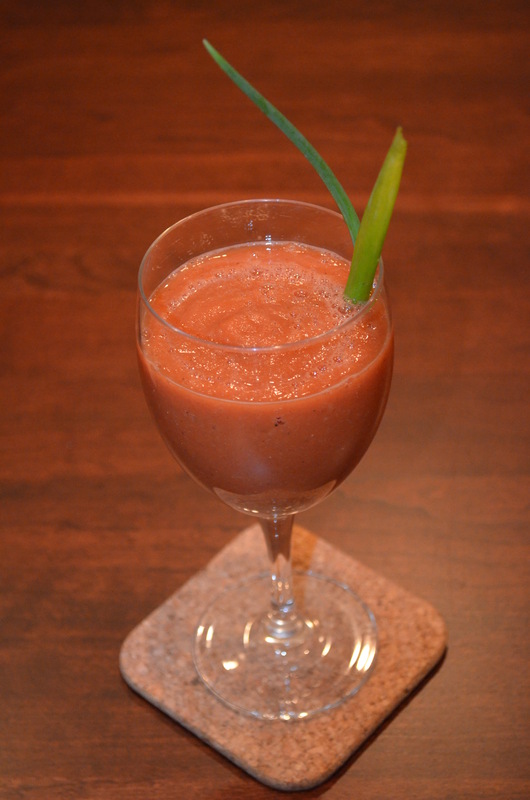 Put all the other ingredients in a food processor along with the activated yeast mixture and an additional cup of water, and process for about 3 minutes to activate the xanthan gum. Grease the inside of two 28oz tomato cans, and divide the mixture evenly between them. Allow to sit and rise for 30-45 minutes, or until 50% bigger. Timing will depend on how lively your yeast is feeling, and how warm your flour (and kitchen) is. In a large pressure cooker, with a trivet or a few forks in the bottom to stop the bread bottom from being scorched on the bottom, bring about an inch of water to the boil. Cover the top of the cooking tins with a layer of baking parchment and then a layer of foil. Tie them down with a piece of string to prevent steam from getting in, and place in the pressure cooker. Put on the lid, and bring up to pressure. Cook for 45 minutes, then remove the pan from the heat, and allow to come down to atmospheric pressure naturally. Remove the loaves from the pan, and allow to cool on a cooling rack.